Local impact happens when community-based tree planting organizations create projects that involve citizens, schools, churches, and government. This is the work of the 125 members of the Alliance for Community Trees program. for Community Trees program. Founded in 1993 and merged with the Arbor Day Foundation in 2015, the Alliance for Community Trees is an integral part of improving communities and towns across the country with trees. October is NeighborWoods® Month — a busy time for Alliance for Community Trees members. 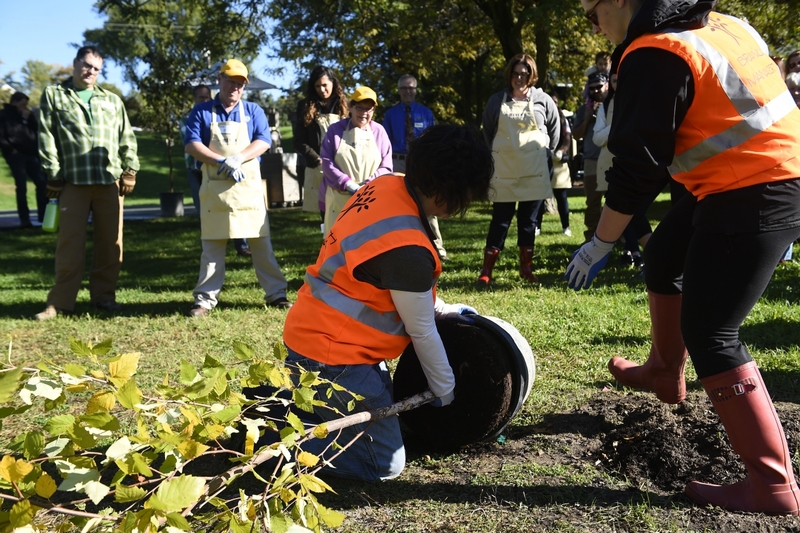 This annual campaign to plant and care for community trees inspires tens of thousands of volunteers to take action to make their communities greener and healthier — keeping their neighborhoods vibrant. To support the tree planting projects organized by Alliance for Community Trees members during this monthlong celebration, more than $1.5 million in funding was allocated to the member groups. With more than 90 percent of Americans living and working in towns and metropolitan areas, the need for informed action on a local level is greater than ever. The Alliance for Community Trees is an integral part of making that happen. The network helps deliver our shared mission at a local community level.